Happy Friday everyone... It's time for a Fun Blog Hop from Newton's Nook Designs. All week long Special guest have been taking over the blog to celebrate Deck the Halls with inky paws week. To wrap the week up we are having a Blog Hop! The Design Team and Guest have created some Fabulous Holiday projects for you and we have a Giveaway... Stay tuned at the end of this post for all the details. I'm using the new Peppermint Die set that's available this week. I started by created a Background with some Salty Ocean Distress Oxide ink on a piece of Watercolor paper that I die cut with the Frames and Flags Die set (currently out of stock but sign up on the website to be notified when this will be available so you can grab yours before they are gone again!) . Then I adhered the panel to a top folding A2 size Black card base and set it aside. I die cut the peppermint pieces from some smooth Bristol card stock. I smooshed the Candied Apple Distress Oxide Ink onto my craft mat and spritzed it with water then I smooshed each piece of the peppermint into the ink. I set it aside to dry and then I added a little more and some water drops, allowing the pieces to dry in between layers. I left the centers White and added a little Hickory Smoke Distress Ink with an Aqua Brush. I adhered the peppermint candies to the background some with Liquid glue and some with Foam tape for different heights. 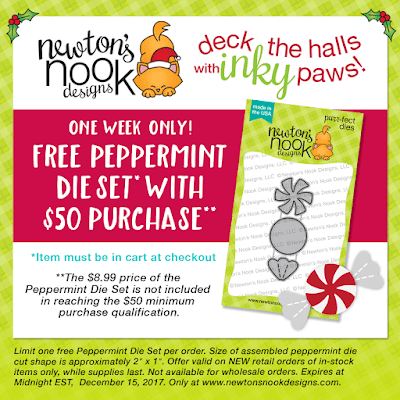 Deck the Halls with Inky Paws Special! Are you ready to get Hopping for some Fun Prizes??? We will be choosing two lucky winners to win a $20 store credit for Newton's Nook Designs online shop! To enter, just leave comments on the Design Team Member and Special Guest blogs (see list below)! Two winners will be chosen at random from the collective blogs in the blog hop. Make sure to check out each of their blogs and comment for your chance to win. You will not know which blog has been chosen so the more you comment on the better your chances are of winning! You have until Sunday, December 10th at 9 pm EST to comment -- winners will be announced on the NND blog on Monday, December 11th. Labels: Deck the Halls, inky paws Hop, newtons nook designs, Peppermint die. Simply amazing! Gorgeous watercolor background with a pop of red!!!! This is really gorgeous! I love the watercolor look you gave the mints and the background too! Thank you so much for being part of our Deck the Halls with Inky Paws blog hop!! Beautiful card using that new peppermint die! I love your cheerful little peppermint candies! This card is bright and colorful and lots of fun! Sweet card! Love those peppermint candies! The inks look great and go together so well. Oh you are so creative! Nice to re-meet you and follow your work! Happy Holidays! Beautiful holiday card. Love the added shadow on the candies..
Beautiful blue background really sets off the peppermints. Gorgeous. What a "sweet" card...sorrry...I could not help myself. Love it. Cheers. Oh, your mints are absolutely gorgeous! I'm just in love with the way you colored them! And that background is perfect! I just love those peppermints! I like the background for these sweet peppermints. When I saw these yesterday I was blown away!! These candy's are gorgeous!! Delightful candy card! The peppermint dies really are great. Even though I don't like to eat peppermints, I love them on card designs! They are so fun and colorful, and make us feel the childhood excitement of Christmas once again! Your peppermints pop against that great background! Oooo, you had me at watercolor. It's funny, but that bright blue gives the peppermints an even cooler feel. You can almost smell the mint! Thanks for sharing a beautiful card! Great background for those cute peppermints! Wonderful card! I love the background colour you chose for your peppermints. Beautiful background paired with the red and white. Thanks for the inspiration. Peppermints with a blue background - great idea! Looks like it’s raining peppermints...fun!